Sacha Mero is running for House District 57 on the Libertarian ticket. Craig — Sacha Mero, Libertarian candidate for House District 57, was arrested at her Craig home June 12 for alleged domestic violence after her husband called the cops to assist with what he called her “medical” or “psychological” behavior. Her husband, Travis Mero, who is running for Congressional District 3 on the Libertarian ticket, feels that the police should not have arrested his wife. Instead, he had hoped the police would help her with the psychological issues she was having at the time. Yet Sgt. 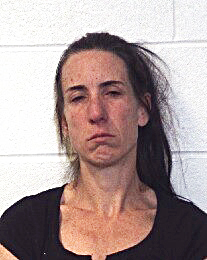 John Forgay, of the Craig Police Department, said the officers who responded to the call felt as though she was the primary aggressor, therefore she was arrested. Because the incident happened in front of their children, she also was charged with child abuse. The children were not physically harmed. The arrest affidavit states that Travis Mero called the cops and said his wife had “lost it” and that he had locked himself and their three young children — two of whom are from Travis Mero’s previous marriage, and the other is the couple’s child — in the bedroom. Travis Mero told the police that “earlier in the evening he and his wife Sacha had argued about him being in Vail where his ex-wife lives,” according to the affidavit. He was in Vail to see a physician for his daughter who was scheduled to have surgery on her broken leg (not related to the incident) June 13, according to the report. Travis Mero told police that after the argument, he tried to leave the house, but as he was backing out of the driveway, his wife tried to stop him, the affidavit states. “Sacha confronted him and the window on the vehicle was partially down, and Sacha was pulling on it and he believed she was going to break it, so he rolled it down. Travis stated after he rolled the window down, Sacha pulled him from the vehicle and the vehicle continued to travel down the driveway towards East Victory Way, unattended,” the report states. Travis Mero ran after the car and was able to put it into park and “Sacha had run up to the car, leaned over him as he sat in the driver’s seat and through the open door and removed the keys from the vehicle,” according to the affidavit. The couple began to argue again, and Sacha Mero started to “throw things around the kitchen,” the affidavit states. She told her husband that she was looking for her pills. She dumped the trash all over the kitchen floor and almost hit their 17-month-old son with the trash can, Travis Mero told police. The affidavit states that the trash can was possibly 55 gallons. That’s when he took his children into the bedroom and called the police. “Travis stated Sacha was able to eventually get the door open, and they were arguing while they both stood in the doorway,” according to the report. Sacha Mero had her husband’s phone and refused to give it back to him, and as he attempted to take grab the phone, she grabbed his arm, pulled it toward her mouth and bit him for about three to four seconds, leaving a mark, the affidavit states. When Travis and Sacha Mero spoke with the Craig Daily Press on June 18, they said they each plan to continue to run for governmental positions. However, Forgay said that the officers who arrived on the scene concluded that it was a domestic violence issue. If it was more of a mental issue, they would’ve sent her to the hospital in Grand Junction to have her evaluated, Forgay added. She explained that when she got out of jail, she saw her counselor and doctor. She’s on antidepressants, she said. “She’s innocent until proven guilty,” Travis Mero said. She was arrested for alleged assault in the third degree and alleged child abuse. Contact Noelle Leavitt Riley at 970-875-1790 or nriley@CraigDailyPress.com.